Two years ago the first museum to win a LEEDs platinum rating opened in the town of Hemet in a arid, rural basin just south of Los Angeles. Owned and operated by the County, and designed by Michael Lehrer Architects, the Western Science Center interprets a trove of fossils that were found when the Diamond Lake Reservoir was created by the Metropolitan Water District. Its mission is to educate the public to appreciate the importance of finite natural resources and our relationship to the environment we live in. 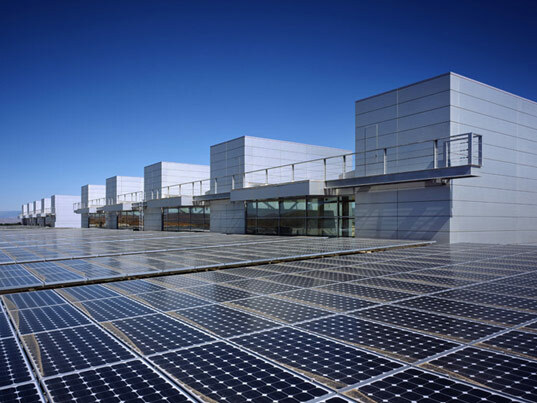 The museum also generates its own power with a massive array of photovoltaic panels. Needless to say this museum fulfills its mission in in its architecture which is strongly influenced by massive public works infrastructure more so than it is by the iconic museum architecture we have come to expect. Thousands of new and existing museums across the country are faced with an energy conundrum. While most museums adhere to a basic commitment to principals of conservation in their mission statements, and science museums are even more committed to discussing principals of sustabability, finite resources and stewardship of our environment, museums are also some of the largest energy consumers among building types. The requirements to maintain constant environmental conditons for the preservation of sensitive artifacts and specimens, the dramatic fluctuations in HVAC loads caused by the heat and humidity of daily throngs visitors and intense theatrical exhibit lighting all put a high price tag on building systems and require high energy consumption. Actually a large percentage of any museum’s project budget goes into the museum building’s mechanical systems. Sometimes this represents a higher percentage of budget than is spent on the public experience of the collections through exhibits and programs. So why not make those systems an integral part of the experience? My guess is that that is what Lerher intended with the Western Science Center. But looking at the design I wonder, is it a ‘green’ museum that fulfills its conservation driven mission, or is it a power plant with a museum attached? This month’s issue of AAM’s Museum News features a great article on museums and energy consumption. Have you ever wanted to explore shipwreck without slipping on your wetsuit? This soon could be a reality not so far away. The Black Sea holds the potential for a new form of experimental museum. This museum will not be any museum that has ever been imagined due to the fact that this museum could be 7,238 ft below sea level. This museum would allow people to virtually navigate a submersible that could allow people to investigate the site, as well as building a showcase of objects that could give greater insight into the past. The reasons for this museum to be imaged at such a depth is due to the fact that as objects are brought to the surface the pressure, oxygen, and UV cause them to change colour and become fragile. The current count for shipwrecks in this area are in the double digits and for explorers this means solving questions to the diverse nature of this region, but at the same time, this means that this type of museum could take decades before being realized and experienced. Around The Black Sea region is an incredible enclave of various cultures, languages and traditions. It is this particular region for centuries that has made the Black Sea a crossroads for cultural movements and trade movements. The Black Sea is significantly different than any other ocean because of the harsh weather conditions that keeps the anoxic water (without oxygen) moving around at a depth closer to the surface creating a protective barrier for the shipwrecks. This preserves anything and everything that descends to that layer including wood, clay, the cargo, and potentially the crews of the ships. The shipwrecks are from the 13th to 15th century B.C. surrounding the Greek Empire which gives the significant of what these finding could mean, seeing that there are only a few manuscripts depicting this period but little insight as to what some objects were actually used for without speculation. Currently, the majority of the findings are on exhibition at The National Museum of History in Bulgaria and at the Mystic Aquarium in Connecticut. The exhibitions at the Mystic Aquarium allow participants to dig for fossils and interact with animals on a more personal level. Currently, virtual shipwreck exploration is becoming a reality through the Venus Project by the Dept of Computer Science at the University of Hull. The aim of this project is to digitally recreate Europe’s shipwrecks before they become eroded and therefore impossible to explore for real. As the project progresses, archaeologists and the public will be able to explore many more shipwrecks in this fashion. The participant interacts with a remote handset that enables the person to control the submarine. This form of application is perfect for the Black Sea due to the lack of decay that exists at these shipwrecks. 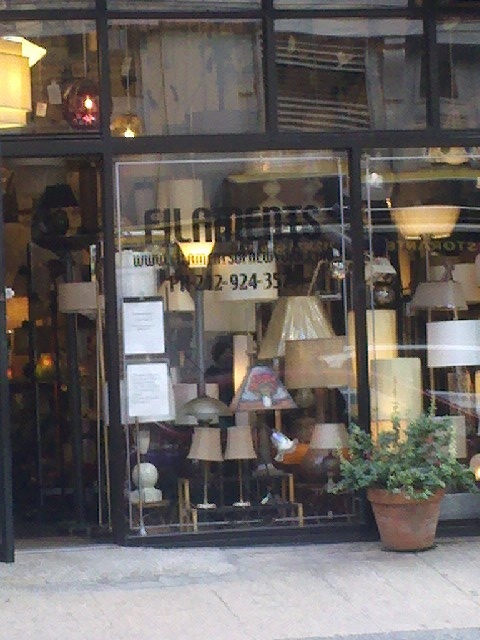 This store has been a landmark in Manhattan’s SoHo art district since 1993; it “sells unique natural history collectibles usually seen only in museums. These include butterflies and beetles, fossils, seashells, skulls and skeletons, medical models, and tribal art.” More here. The second I walked into this store it immediately reminded me of the Cabinets of Curiosity; the way the objects are presented and the whole store is structured is similar to an early museum. For those of you who are not familiar with the Cabinet of Curiosities also known as Cabinets of Wonder, or Wonder-Rooms [Wunderkammern], these were encyclopedic collections of objects whose categorical boundaries were yet to be defined in Renaissance Europe . Modern terminology would categorize the objects included as belonging to natural history, geology, ethnography, archaeology, religious or historical relics, works of art and antiquities. It was regarded as a microcosm or ‘theater of the world’, and a ‘memory theater’. Peter Thomas stated about Charles I of England’s collection that these were “a form of propaganda”, only for the aristocrats and only some could afford having them. Besides the most famous, best documented cabinets of rulers and aristocrats, members of the merchant class and early practitioners of science in europe formed collections that were in fact the precursors to public museums. One of the newest and most anticipated installations in the world of Natural History is the London Natural History Museum’s Darwin Centre 2. This iconic facility opened a month ago and a few friends have since visited and reported back to me. The Cocoon – a large egg shaped structure inside a glass box and provocatively nestled up against the Victorian-Era museum building – contains 20 million insect and plant specimens as well as 220 working scientists. One of the overarching goals of the project is to make the museum’s collections and research accessible to museum visitors. 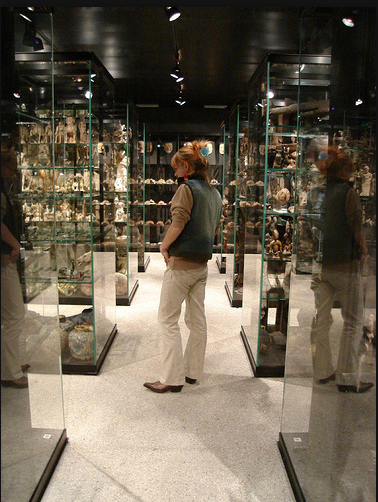 This is a general trend as museums of all types seek to engage more sophisticated audiences by providing access to previously hidden away: study collections, research, registration and conservation. Darwin Centre 1, which as a sort of modest prototype for this project built a few years ago (and which I did visit), used curators as docents that took you on behind the scenes tours of collections areas as they talked about their work. You felt privileged to have access to their world and though it still had carefully controlled set of windows, you saw a lot of real stuff. I suppose a day long program of tours was a lot to ask of the curator whos’ minds should really be on research and not entertaining the public. Darwin Centre 2 seems to dispense with the warm, human (albeit scripted) interactions. Here a set of digitized curator avatars introduce the audience to the research and the experience is focused mostly on a series of interactive media experiences that allow visitors to explore both real and digitized versions of collections, interact and provide feedback on a range of current scientific debates. I kind of like the mix of real stuff and high tech interactive interfaces, but word is that the human touch and the awesome spectacle of millions of specimens is missing here. I think this is a great model for existing museums to leverage what they already have going on behind the scenes and deliver a public view into the authentic, mysterious, museological, inner-sanctum. However, the walls of this cocoon may be still too opaque. Another review with descriptions and images of a few exhibits here and the official video tour here and another video here.